Standard Vee or inverted Vee. With or without polyester reinforcement. Optional Rough Top or Super Grip affixed to the top surface. Super-Strong Welds allow the belt to run on smaller pulleys with sharp back bends. Colors: clear, orange, red, green, blue, light.blue, white, yellow, brown, black. Warning, do not use urethane belts on slider beds. See Spool Flanges for V-belts used as spool flanges on motorized rollers. See Roller Sleeve Spacers for V-belts used as spacers to raise product above the rollers. *Also available reinforced with polyester or glass fiber cord. 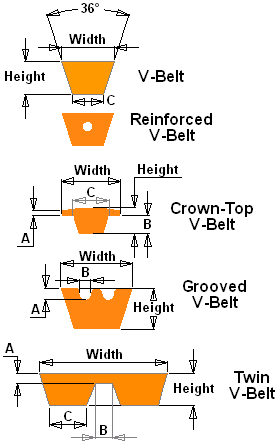 For the best in urethane V-Belts & Vee Belting, insist on DuraBelt.